These coders are ideal for On-Line High Speed Coding on packaging machines or bottles moving on conveyor. The message to be printed is very easily composed on its graphic display using the integrated complete QWERTY keyboard. The message can be upto 4 lines with a combination of small, medium or large characters from 1 mm to 17 mm in height along with LOGOs. 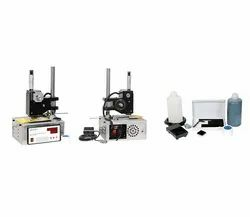 The Inking system consists of a simple disposable pre-mix ink cartridge using fast drying & indelible solvent-based inks (for porous and non-porous surfaces) which is just push fitted into its SLOT & immediately you can start printing. The small print head is then placed aligned with the object or substrate & whenever the product sensor gives a signal, the whole message is spray-printed onto the substrate while it is in motion without touching it. Offering Motorized Table Top Batch Coding Machine.LCD base controller for DC stepper motor makes this model more reliable. The key features are does not rekuier pneumatic compressor for operations. Specially designed table top stand for both automatic & semi automatic printing tin, boxes, labels, pouches, bag, and bottles. In built timer for automatic timed operations or can be connected to a proximity or foot switch for controlled operations, Imported stepper motor and accessories provide reliability, ONG life and speed up to 60impressions per minute. These are also called asTable Top Coder. 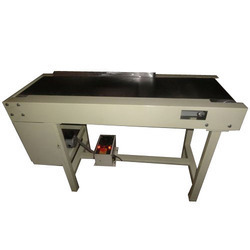 We are one of the noteworthy enterprises engaged in offering superior quality Motorized Pad Printing Machine. This machine is suited to print notes and signs such as manufacture date, lot number and single designs on various kinds of bottle, jug, cup or box based on every type of materials, with fast printing speed, cute and clear letter form. In addition, clients can opt for different dimensions according to the specific business needs. Further, machine offered by us has gained highly appreciation among our clients. Besides, clients can avail the machine from us at cost effective rates. Looking for Coading Machine ?